G2A continues its tradition to offer us lots of games, different subscription and gift cards and trial periods with reductions each weekend. 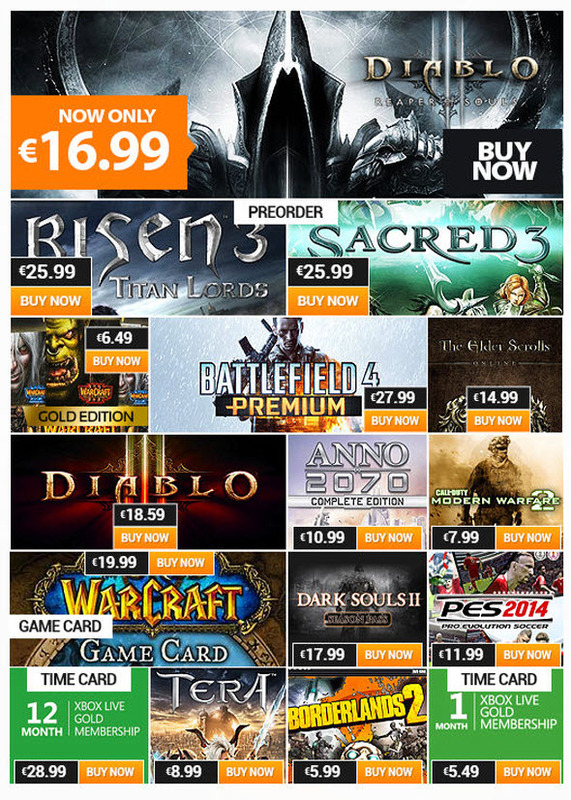 This time you can pre-order Sacred 3 or Risen 3 - the games, which both will be launched next month, - only for €25,99 each that is not expensive at all, as for us. Or, if you are a real fan of football simulators, you can buy Pro Evolution Soccer 2014, which this weekend will cost you only €11,99. It’s not a bad bargain, is it? 13) Tera Online Standard CD-KEY (EU) is available for €8,99. Buy and pre-order the games with reductions here and then go back on G2A.com in order to earn money with Goldmine programme, more about which you can read here. The sale begins today - on the 25th of July - at 15:00 GMT, and it will end on Monday - on the 28th of July - at the same time. Don’t waste your time!